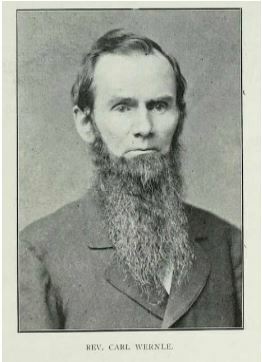 On August 29, 1847 the Honorable Carl Wernle was married to Emilie Spannagel by Pastor F. W. Richman in Sponagle Lutheran Church. Pastor Carl Wernle and Emilie were parents of five children: Julie, Otillia (Tillie), Carl, Carrie, and Irene. As they ministered they preached in several places in Ohio and Indiana spending most of their time in Galion, Ohio. In 1878 at the age of 48 Emilie died and was buried in Upper Sandusky, Ohio. In memory of his wife, Pastor Wernle made a bequest of $500 to the synod of the Trinity Evangelical Lutheran Church for an orphanage. The 1880 synod minutes states that the first building of the Wernle Orphans Home and Asylum for the aged in Richmond, Indiana was dedicated May 4, 1879 with 58 orphans in their care. Little did Pastor Wernle know that his legacy would be felt by children more than a century later, serving more than 50,000 orphans, aged widows, and youth. Leaving a gift in your Will provides funding for the long term, allowing Wernle to develop a clear plan for the years ahead. Please consider including Wernle in your estate plans. Thank you. A gift to Wernle can be made in a number of different ways – as a bequest, as a memorial or tribute to another person, as a spontaneous online donation, or as a contribution to the Wernle Endowment. Make an even bigger impact to restore and heal troubled youth by making your gift monthly. Becoming a monthly donor means more care for the youth who need it the most. In 2019, Wernle will be celebrating 140 years of serving the most vulnerable. In honor of this milestone and the philanthropy of young professionals, Wernle has marked this occasion with a giving society that honors young donors under the age of 40. Those that make a commitment of $140 in each of the calendar years of 2018 and 2019 will be included in the 140 Club. The goal is to have 200 young donors for each year. Become our partner in rebuilding relationships and restoring hope for youth into the next decade! You can remember and honor someone special by making a gift to Wernle in their name. Your employer and coworkers can join you in helping our youth. There are multiple ways to get involved through workplace giving, including payroll deductions and matching gifts. Be a part of our future by including Wernle in your estate plans. Your legacy can help support our shared vision of restoring hope to our youth. The efforts and generosity of our partners and their corporate giving initiatives have significantly enhanced Wernle’s youth-efforts. Join their efforts by involving your corporation or foundation. We need your help getting your friends and family involved in our mission. A personal fundraiser is an easy and effective way to impact the lives of our youth together. An increasingly popular charitable vehicle, donor-advised funds, are an excellent way to both simplify your charitable giving and facilitate your strategic philanthropic goals. Wernle welcomes the opportunity to consider in-kind gifts of books, games, activity supplies, recreation equipment, capital improvements and other tangible items. In-kind donations directly benefit our youth – and makes a real difference in their lives. Stocks, bonds or any other securities can be transferred as gifts. If the stock has appreciated in value, the holder can avoid paying the capital gains tax by giving it as a gift. Thrivent Choice – An opportunity to make a difference to our youth. Thrivent Choice is a member-advised charitable grant program that makes it easy for eligible Thrivent members to help support our organization and its mission to help the hurting children. You have the opportunity to distribute Choice Dollars charitable outreach funds to Wernle. Search for “Wernle Youth and Family Treatment Center”.